I grew up taking art lessons from the local artist superstar, Sue Hand. She first introduced me to the wonders of Andrew Wyeth with several trips to the Brandywine River Museum in Chadds Ford, Pennsylvania. Andrew Wyeth made the simple life feel magical and enchanting somehow. A ray of sparse light could enlighten an entire canvas where bare, winter ridden trees became marvelous texture, instead of the reminder of the cold months to come. In this particular project I felt compelled to capture how Mr. Wyeth might paint a composition of love and marriage. 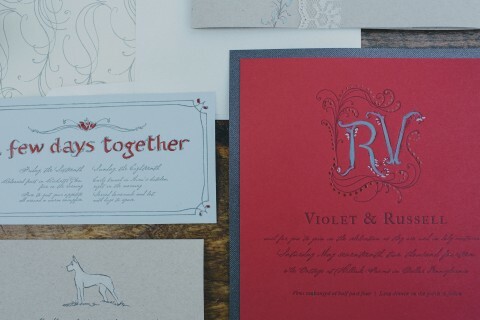 Sparse styling, stationery rich with velvety color and artistic details remind us at every turn, of the meticulous master of American Art.